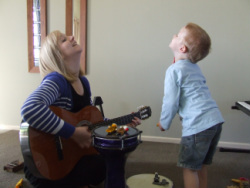 Shari loves co-creating with kids, enabling them to lead and find their voice and place in the music therapy room, seeking to develop playful, musical interactions that guide and gently encourage progress. Youngest client at age 15 months, Shari has worked and/or currently works with children and adolescents living with special needs including asperger's, autism spectrum disorder (ASD), attention deficit hyperactive disorder (ADHD), cerebral palsy, developmental delay, down syndrome, vision and hearing impairments. Shari has a particular interest and specialty in supporting communication development following her Masters research on how music therapy can be used to support pre-schoolers' speech and expressive language development. For a child or young person working on physical development, action rhymes and making music on a range of instruments specifically chosen to address their needs is a fun, positive way to facilitate development of fine and gross motor skills, oral motor skills and coordination. 'The Animal Boogie' song in action - stretching your neck like a giraffe, stomping like an elephant, swinging your arms like a monkey towards physical development as well as incorporating and encouraging animal sounds and eating sounds to develop speech and expressive language. For a child or young person who needs support with their social skills and communication, music-making opportunities can be used to encourage and develop skills such as eye contact, joint attention, and turn-taking. Playful but focused songs, behaviours and instrumental play can enhance speech and expressive language development. 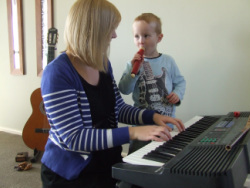 The 'Toot Toot' song in action - playing a wind instrument such as a slide whistle can support the development of oral muscle tone and breath control; capturing children's preferences and vocal activity in the content and structural aspects of playful but focused song i.e. repetition of the word "toot" or targeting a consonant, "t t t t toot", pausing for children to fill-in-the-gap; developing eye contact, waiting in anticipation of their role as well as turn-taking. ​Music can provide a highly motivating, un-pressured medium with which to support children towards broad, long-term goals within development including physical, social and communication, emotional and cognitive spheres of life.